I have returned from my adventure in Turkey, and I must say, the food there (and my cooking class) was absolutely one of the best things about that country. Especially if you are a vegetarian, as they have amazing vegetable dishes and, at least in the touristy parts, understand when you say you are vegetarian. People didn’t even ask if that meant I ate fish! I ate so many amazing things while I was over there, but unfortunately there are way too many to stick in one post. So here are some of the dishes I had, loved, and remembered to take pictures of. 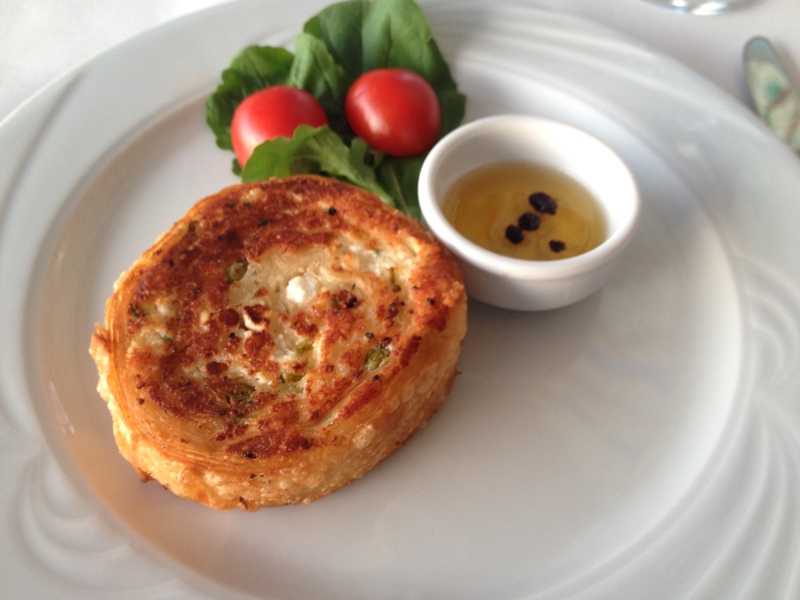 Also – the Turks love cheese, which made me love the food even more. This comes first because it was so freaking amazing and one of my favorite things there – I had it an an Ottoman restaurant (aka making ottoman-era food, mostly from the palace based on historical records). 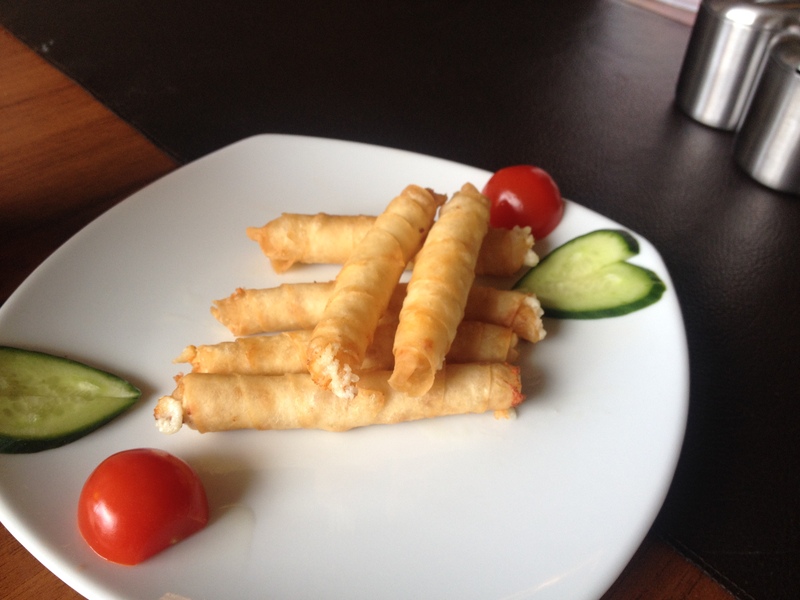 Apparently, they use seven different kinds of cheese and wrap it in filo to make a spiral, and then fry it til golden. They served it with a couple things, including honey, which was perfect with it. I don’t know if I want to attempt to recreate it or not, I’d hate to try and have it not be as awesome as it was there. So the picture is of the stuffed eggplant I made in my cooking class, but I had it other places too when I was in Turkey, it was very common on menus in Selcuk. The version I had in Selcuk didn’t have mushrooms, it was just tomatoes, onions and various herbs and spices from what I could tell. It, however, was also served with yogurt and a side of rice, and was insanely good too. I think I might just omit the mushrooms when I make this myself. Also, and I did this with most veggie dishes, you can scoop it onto flatbread maybe add a bit of the yogurt, and eat it that way. Eggplant dishes work particularly well when you do this. 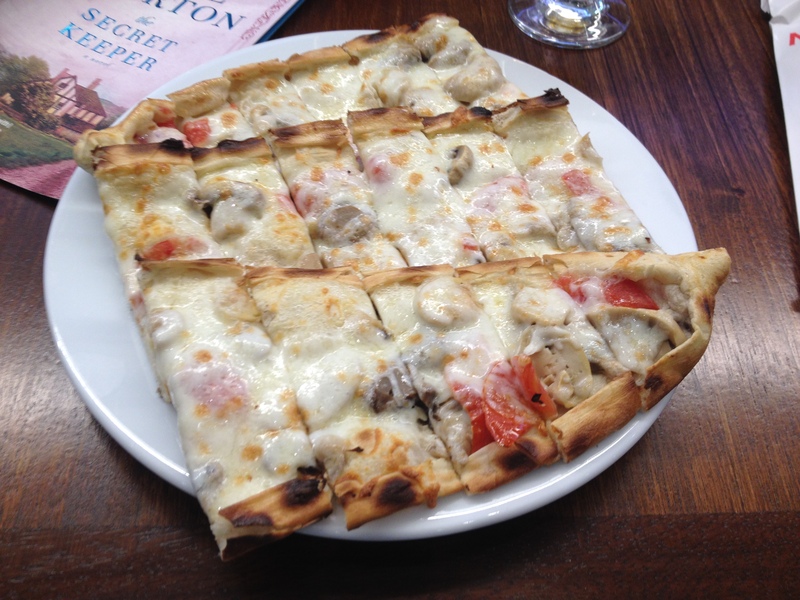 Pide is basically Turkish pizza. I made a version pide a while back, and I still make it on occasion. This, however, tasted less healthy and flavorful than what I made, and am used to. That said, it would be an amazing drunk food. The one I had there was a good with beer and I’ve had a couple food (which is the stage of the evening I was in), and would be a bad sober food. At least in my opinion. Song of the week: The Suffering, by Coheed and Cambria. I’ve been listening too this song a lot lately not sure why. It’s hard rock, with an awesome combination of upbeat and darkness. Hell, maybe my emo teenaged self is just coming to the fore for some reason this week. But its awesome, so you should listen to it. One caveat – this is hard rock, you need to listen to it very loudly for the proper effect. As I am writing this, I am sitting in Turkey, in the midst of my current travelling adventure. Woo! As you may know from previous posts, I like to document the foods I eat when I travel around the world. 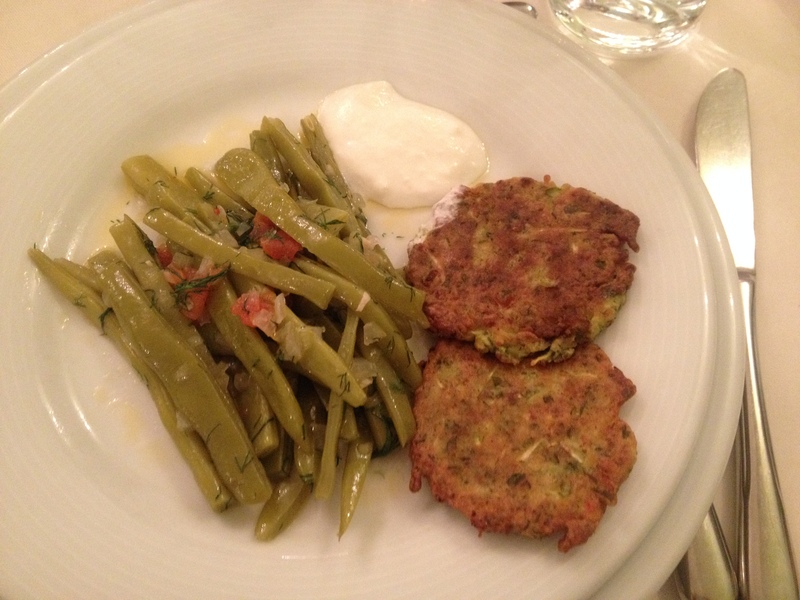 This time, however, I managed to do one better – I found a Turkish cooking class in Istanbul that would accommodate vegetarians – Cooking Alaturka. Now, if you intend to go to Istanbul in the vague or near future and enjoy cooking I highly recommend this class. The instructor is extremely knowledgeable, the chef is incredible and hilarious, and no matter how good a cook you are, you will pick up some new tricks. Now, the class of six of us, plus the experts teaching us, made six recipes: hot yogurt soup, beans cooked in olive oil with tomatoes, zucchini pancakes, stuffed eggplant, bulgar pilaf, and stuffed dried figs. No, I’m not going to stick all six on this blog, that would be ridiculous. If you want all six, you will have to take the class yourself. 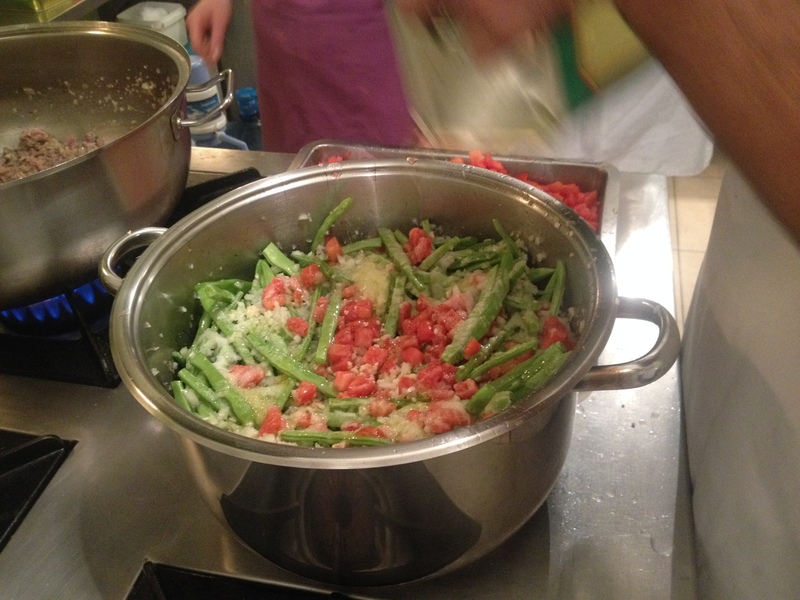 However, this is one of the most straight-forward recipes, and Eveline, the instructor, assured us the method could be adapted for other veggies as well. Prep all the veggies first. Then assemble them in a saucepan. First, put a layer of the onions-tomatoes-and garlic, then a layer of the beans, then an onion-tomato layer, then more beans, then the last of the onions-tomatoes-garlic. In a bowl, whisk together the olive oil, sugar, lemon juice, salt. Taste to make sure you like the balance of ingredients. then add the water and whisk it in. Add the liquid mixture, which should almost, but not quite cover the veggies. Cover and cook on medium-low heat until softened, maybe 20-30 minutes (check as I’m not sure about the timing). Remove from heat and let the mixture cool in the liquid. Fish out the veggies and serve when at room temperature. 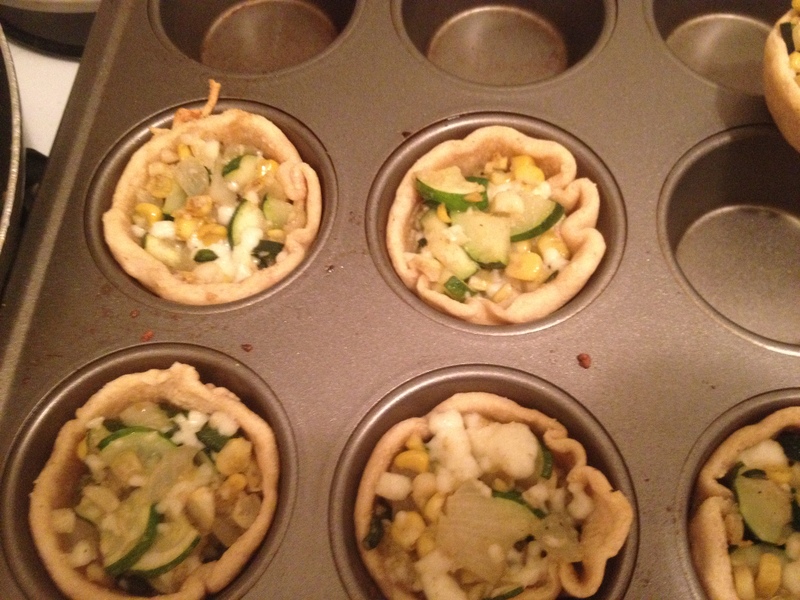 The result – extremely tasty. 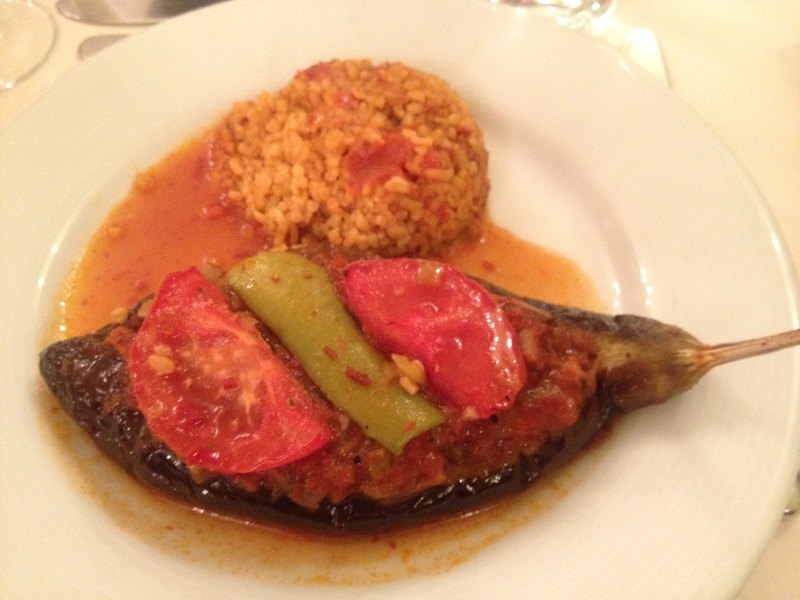 I’ve always liked Turkish foods, but this trip has made me completely and utterly love them. This veggie recipe is tasty and light, and (if I hadn’t had it as part of a 4-course meal) would make a great meal with some bread and cheese. I had this with a Turkish rose – which was extremely good, albeit less fruity than roses that I’m used to. Song of the Week: Istanbul, Not Constantinople, by They Might Be Giants. Very nearly every time I mentioned going to Istanbul to my parents, they referenced this song. Which is a fun and cute regardless and I was definitely humming it to myself walking around the city so it is nothing if not appropriate for this week. Sometimes, I plan things out a little too well. I’m leaving for Turkey tomorrow (woooo!!!!!) and carefully planned out my meals and grocery shopping so I could maximize my healthy life choices. Then today rolled around, and I realized I didn’t really have anything to experiment this week with. Well, I did have a russet potato, and a couple eggs left, so I thought of the steampunk savory fritters I made a couple weeks ago. However, this time I figured what the hell, lets make the sweet version. I had to adapt a couple things as per usual. Bake the large potato (or, if you have limited time, stick it in the microwave for a few minutes). Remove the skin and mash the potato in a large bowl – I find it easiest to just use a fork. Add the all the other ingredients, saving the egg for last. If you are really motivated you can separate the egg, beat the egg white til soft peaks form, and fold it in but I’ve found it largely unnecessary. The batter should be fairly cohesive and not lumpy. Heat some oil in a large frying pan. Once the oil is hot, add plops of the batter and flatten them out a bit. Fry until both sides are golden brown, and remove onto a paper-towel-lined plate. Serve warm. Ok, so I definitely used too much Grand marnier. Whoops. I used 2 tablespoons, which is why I decreased it to 1 1/2 in the posted recipe. It did not all cook off also – just to warn you. 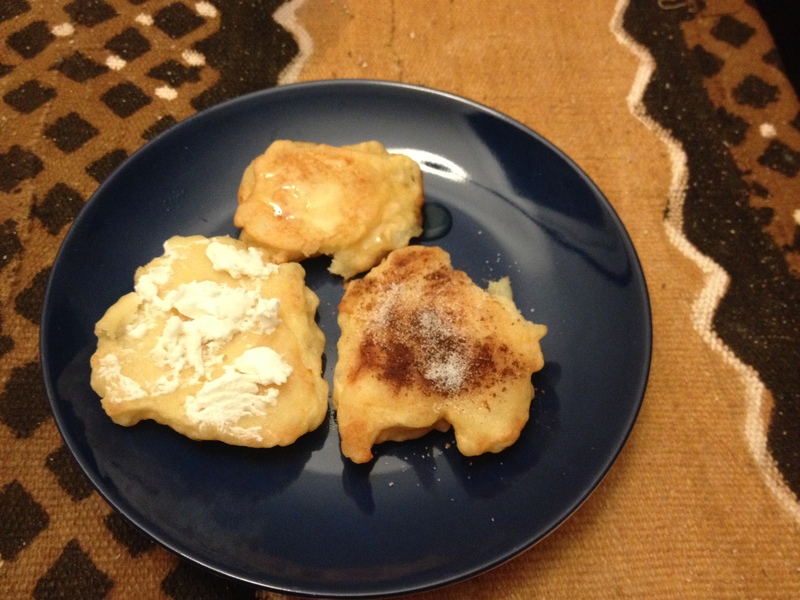 You can eat them by themselves, but I tried a few different toppings – goat cheese, cinnamon sugar, and honey. All were pretty good, but I liked the goat cheese best – I love a savory bite to these sorts of things. I didn’t have these with any alcohol, but if you were going to, I would suggest a reisling, or, if you want to really roll with the Victorian theme, port. I think they’d be good with port. Song of the week: Baba O’Riley, by The Who. I’ve been in something of a Who mood lately, and this song, despite its overplayed-ness, has particularly been speaking to me. Especially the line “I don’t need to fight to prove I’m right; I don’t need to be forgiven.” Love it. Sometimes you just need a song like this in your life. As you might have guessed from the name of this post, I’m a bit of a steampunk fan. Not a huge fan, but one of my all-time favorite books series is a urban fantasy/steampunk mishmosh of awesome. So when I was trying to come up with something for this week, I remembered that there is this food blog – Tentacle and Treacle – inspired by the series. 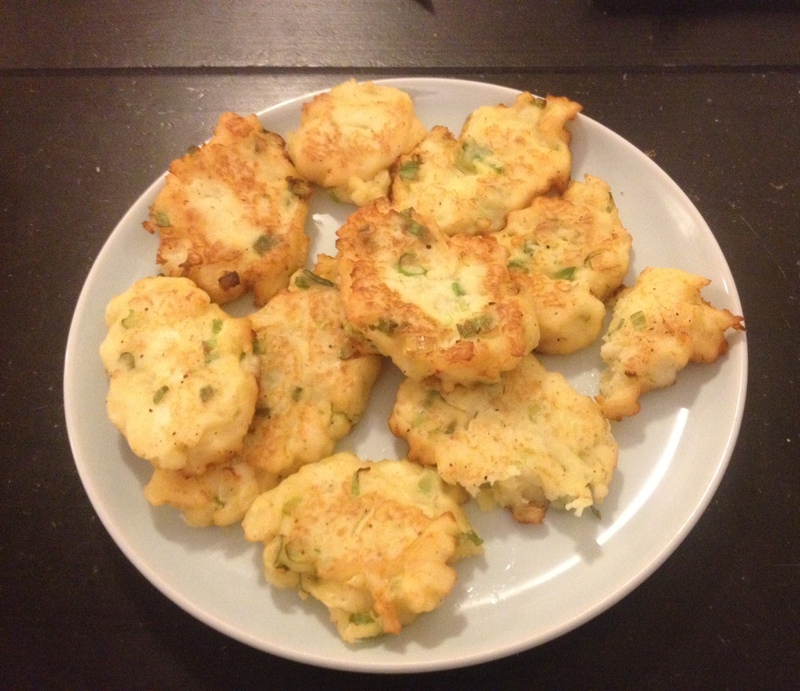 Sadly Victorian food is not the most inspired cuisine, particularly for a vegetarian, but I saw the potato fritters post and it so naturally I had to try and make a version. I decided on attempting a savory version, rather than staying true to the recipe, as I wanted something more dinner-ish. Bake the large potato (or, if you have limited time, stick it in the microwave for a few minutes). Remove the skin and mash the potato in a large bowl – I find it easiest to just use a fork. Chop the onion (a spring onion is basically a massively oversized green onion), and add it to the potatoes. Add the all the other ingredients, saving the egg for last. If you are really motivated you can separate the egg, beat the egg white til soft peaks form, and fold it in but I’ve found it largely unnecessary. The batter should be fairly cohesive and not lumpy. Heat some oil in a large frying pan. Once the oil is hot, add plops of the batter and flatten them out a bit. Fry until both sides are golden brown, and remove onto a paper-towel-lined plate. Serve warm. Tasty! A little on the bland side, as they can be slightly improved by adding cheese or ketchup on top. I am kicking myself a little because I was going to stick cheese in them and then I changed my mind – proof that initial impulses can in fact be good life decisions. But these are still extremely good, and weirdly tasted even better the next day. Not sure how that works. Song of the week: Highway to Hell, by AC/DC. I was listening this on my way to work the other day and it seemed eerily appropriate, like a musical Freudian slip… Also, it’s an awesome song and you should rock out to it regardless.